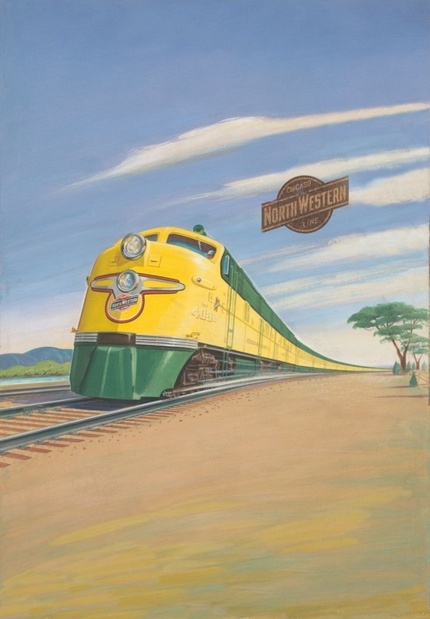 The Chicago & North Western Railway - Route of the "400"
1. $1 Universal Handling Fee applies to all orders. 2. Shipping services are limited to USPS First Class or Priority Mail strictly at shippers discretion. 3. Maximum weight limit to qualify for free shipping is 4 pounds per order. No credit or discount will be extended for large or overweight items or orders. 4. Returned merchandise shipped using the FREE SHIPPING offer will be assessed a restocking fee of 5% of order total. 5. Shipping on decoder installations and all other custom services are excluded from this offer and will be charged at regular market rates. 6. Flex-track, cork roadbed, Good-deals DCC test tracks, NCE Brutus Power Supplies, ESU ECoS Command Stations, and most KATO track sets as specifically excluded due to size and weight. 2. The FREE SHIPPING option must be chosen by the BUYER during order checkout. Use of this offer is not monitored except for exclusions and limitations and it WILL NOT BE APPLIED RETROACTIVELY. 3. Domestic shipping services are limited to USPS First Class or Priority Mail strictly at shippers discretion. All international shipping options are excluded from this offer. 4. Maximum weight limit to qualify for free shipping is 4 pounds per order. No credit or discount will be extended for large or overweight items or orders. 5. Returned merchandise shipped using the FREE SHIPPING offer will be assessed a restocking fee of 5% of order total. 6. Shipping on decoder installations and all other custom services are excluded from this offer and will be charged at regular market rates. 7. Flex-track, cork roadbed, Good-deals DCC test tracks, NCE Brutus Power Supplies, ESU ECoS Command Stations, and most KATO track sets as specifically excluded due to size and weight. Normal leadtime for most stock products is 1 week or less. Normal leadtime for made-to-order products is usually 2 to 4 weeks. Normal leadtime for decoder installations is 8 to 12 weeks. Depending on load, schedule, and complexity, leadtime may be extended for up to 16 weeks or more. I will advise you of any further changes to this schedule upon receipt of order. I do not have a "brick-and-mortar" storefront. SBS4DCC.COM is my primary sales outlet. I attend shows and other sales periodically to further market my products. All items are subject to prior sale. It may take me an extra day or two to acknowledge your order if I am away. I will advise you of any issues that may affect prompt handling of your purchase upon receipt of order. I strive to provide next day service on items I stock. There may be instances when it is necessary to back order certain items. I will advise you if there will be a significant delay in delivery. Additional shipping charges will apply for multiple shipments. I prefer payment for products to be made in full via Cash, Check, Money Order, Credit Card or Pay-Pal at the time of purchase for retail items. I prefer payment for backshop services to be made in full via Cash, Check, Credit Card or Pay-Pal upon successful completion of the project. Some projects may require a deposit in advance. Checks may delay shipping as much as 15 business days. Delivery of funds is the BUYERS responsibility. My e-commerce site is protected by a verified SSL provided by Network Solutions, Inc.
All login, personal account, and financial transactions are protected by this license. All sales shipped to destinations in the State of Indiana are subject to Indiana sales tax at the current rate at the time of order. Estimated shipping charges can be obtained by adding the desired item to a shopping cart, entering your ship to information, and then selecting the desired shipping method. I do add a small fee to each order to help cover my overhead costs and packaging expenses. I too am shocked at the current prices for USPS and UPS services, but at the end of the day, it is what it is. I will continue to look for ways to keep this added cost to a minimum. As always, I will gladly combine purchases to help minimize this cost. I am able to offer shipping worldwide via USPS, UPS, Fed-Ex, or DHL. I can also ship via common carrier as required. All freight charges are FOB Lizton, IN 46149. Local pick-up is also available at zip-code 46123 upon request. Delivery is also available however additional handling charges will apply. Please request and confirm special handling of your order prior to purchase. Changes to the requested shipping method may be required due to size, weight, or unavailability of the requested service. I reserve the right choose and use alternate shipping methods at my descretion for any order regardless of the method requested on the order without notice. Additional charges may apply and you will be contacted for payment information as required. I will gladly combine purchases AT MY DISCRETION to reduce your shipping charges. If you plan to make multiple purchases and there will be a delay between orders, please let me know so that I can hold your shipment until the order is complete. I will not ship oils, grease, paint, glue, aerosols or similar type items to international destinations. They WILL NOT make it to you safely. I am happy to ship to any country worldwide. Because of the obvious issues of time and space, I cannot be responsible for these shipments once they are "In The Mail", so to speak. I will provide a copy of customs documents as proof-of-shipment upon request. For shipments where the value exceeds $75 USD, we strongly recommend using USPS Registered Mail, Priority Mail or Express Mail. These options costs a bit more but they are the safest methods and they are the only way to obtain a tracking number for your shipment. Please include your postal codes exactly as you provide it locally in the comments section. I simply cut and paste the information to an address label exactly as you have entered it to avoid any errors in typing or format. I have successfully completed transactions to the following countries: Canada, Mexico, Chile, Brazil, Ireland, Scotland, United Kingdom, Australia, New Zealand, New Caldonia, France, Italy, Spain, Switzerland, Belgium, Austria, Portugal, Poland, Germany, Latvia, Bosnia, Czechoslovakia, Russia, Japan, Taiwan, Indonesia, The Phillipines and Hong Kong. Most purchases ship within 24 to 48 hours from receipt of order. The order cut-off time for next day shipping is 11pm EST. I try to ship daily however I may adjust this schedule during the summer months in an effort to minimize transportation and handling costs. Delivery confirmation is included on most shipments. I will notify you by email when your order has shipped and provide you the confirmation/tracking number when available. This schedule is subject to change at any time without notice. I cannot be responsible for lost or damaged shipments. USPS includes $50 insurance and UPS includes $100 insurance with each shipment. Additional shipping insurance is the buyers responsibility. I am more than happy to arrange for it at time of shipment I just don't pay for it. Please include extra monies and instructions as required with your payment. Please contact the shipper ...not the seller... immediately to report any damage from shipping and to file a claim accordingly. I cannot file any claims on your behalf but will assist you with proof of shipment as required. I reserve the right to determine if an order may be cancelled. A minimum 10% cancellation fee will apply. Additional fees WILL be charged based on expenses incurred at the time of cancellation request. Please make all requests for cancellation in writing and I will respond to your request as quickly as possible. Most items are supplied with a manufactures warranty that applies to that item specifically. Please refer to the manufacturers website for information about their specific policies. Streamlined Backshop will warrant decoder installations and custom-made products for a period of 30 days from date of shipment for failures resulting from a faulty installation or assembly. This warranty does not cover failures as a result of erased, lost, or modified programming, mis-handling or mis-use of the product. This warranty covers time and materials only. Streamlined Backshop is not responsible for any shipping charges associated with any warranty claim. All claims should be made in writing and are subject to inspection and approval by Streamlined Backshop. While we make every effort to manufacture and test Made-To-Order items as accurately as possible, we do make mistakes. Made-To-Order items ARE NOT returnable or refundable especially made-to-order designs that are, well, made just for you. Please write or call us to discuss your concerns. We usually don't need to do more than that to resolve these kind of situations. If you are dissatisfied with a product for any reason, you may return it for a prompt refund or exchange up to sixty days from the date of purchase. Returns will only be accepted for new and unused product. Open items not returnable or refundable. Refunds for items returned within thirty days of the purchase date will be credited in the same form as the original payment type. Refunds for items returned more than thirty days after the purchase date will be in the form of a credit redeemable on your next purchase. The original shipping and handling charges are not refundable. A 10% restocking fee may apply. Please mail your package in a prepaid, insured, traceable method to the address below. We are not responsible for lost or damaged items. This Web site may contain typographical errors or inaccuracies and may not be complete or current. SBS4DCC.com therefore reserves the right to correct any errors, inaccuracies or omissions (including after an order has been submitted) and to change or update information at any time without prior notice. Please note that such errors, inaccuracies or omissions may relate to pricing and availability, and I reserve the right to cancel or refuse to accept any order placed based on incorrect pricing or availability information. I apologize for any inconvenience. This Web site, and any information or content on this Web site, are provided "as is," with all faults. SBS4DCC.com makes no representations or warranties of any kind, whether express or implied, with respect to this Web site or content or information available on or through this Web site. Except as otherwise provided under applicable laws, neither SBS4DCC.com nor its affiliates, nor the directors, officers, employees, agents, contractors, successors or assigns of each, shall be liable for any damages whatsoever arising out of or related to the use of this Web site or any other Web site linked to this Web site. I do not make any warranties about the completeness, reliability and accuracy of this information. Any action you take upon the information on my website is strictly at your own risk and I will not be liable for any losses and damages in connection with the use of my website. From my website, you can visit other websites by following hyperlinks to these sites. While I strive to provide only links to useful and ethical websites, I have no control over the content and nature of these sites and the links to other websites do not imply a recommendation for all the content found on these sites. Thank you for your patronage, your patience and your understanding.